Our 1 day Paediatric Emergency First Aid Course centres around teaching the basic skills needed to help a young child or baby in an emergency situation. This course is ideal for individuals who do not need to provide emergency paediatric first aid in a work environment but would like the knowledge to be able to apply these skills, if needed, in their every-day life. This course is suitable for parents, grandparents or individuals with a responsibility for caring for young children and infants who are not required to have a qualification to meet Ofsted's requirements. For those requiring a qualification to meet Ofsted's standards, we off a comprehensive 2 Day Paediatric first aid course that covers the full range of first aid skills required by first aiders working with children in school, nurseries or as nannies or au pairs. •	has a childhood condition, such as meningitis. What do I need for this course? When you come on the day, please bring one form of photographic ID, a packed lunch and a pen and paper. Please also wear clothes that are comfortable, and that allow you to kneel and lie on the floor easily. 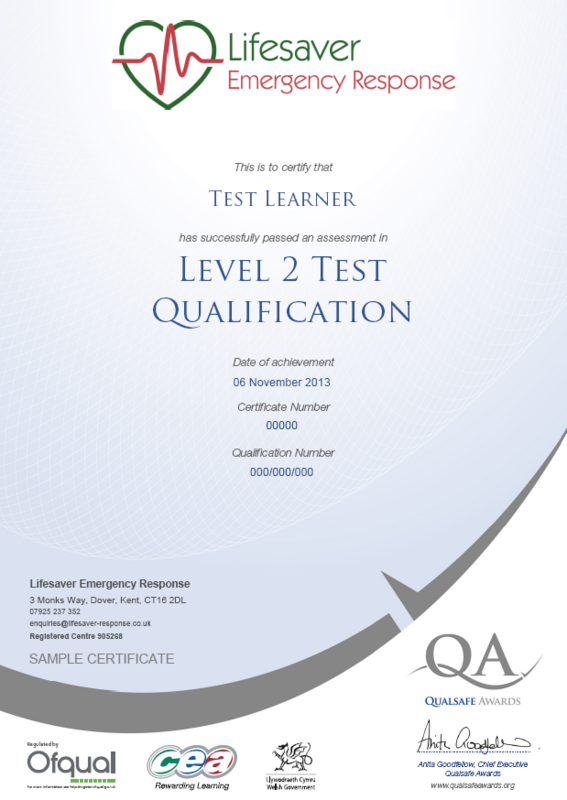 This course is assessed through ongoing trainer assessment, 5 practical skills tests and one short multiple choice test. The written test is currently only available in English, so a basic understanding of written English is essential. On successful completion of this course you will be awarded you will be awarded a Level 3 Award in Emergency paediatric first aid certificate, which is valid for 3 years. You will be awarded both a wall and wallet certificate to display your achievements. Annual refreshers and CPD are strongly recommended - please contact us for details of appropriate courses. Fantastic day – thank you! Everything was explained very well and I liked that we could ask lots of questions! A well paced and informative course with lots of relevant additional advice and discussions. Ben made good use of the ‘borrowed’ teaching environment! A very interesting day and appropriate to the level of knowledge of first aid required. Useful information regarding the ‘practicalities’ – accident book, record keeping, first aid equipment, etc. Thank you. Ben was able to give clear and consise instruction in plain English that you can understand. He was able to answer and explain questions in a polite and helpful manner. Thank you! Difficult subject handled very well. Very informative and practical. I feel more prepared. Thank you. Copyright © LIfesaver First Aid Services 2019. All rights reserved.